After getting emails and comments for a while now asking about a Facebook presence, I have created a MemsaabStory page there. When I figure out how, I will link the blog and the Facebook page so that you can get updates in your feed if you “Like” the page. If you don’t want updates bombarding your wall, then ignore this. I plan to try and post some of the awesome things I stumble across occasionally or (more often) people send to me too. I know I have been quieter than usual, there is just a lot going on right now. Hopefully I will soon get back to having no life so that I can watch movies again. Until then—see you on Facebook! Posted on May 16, 2011 at 3:00 pm in Everything else, Hindi movies	| RSS feed You can skip to the end and leave a reply. so will it be sort of a mirror page? Well, it will contain notifications of new posts here but I want to also put things (links, screencaps, things that make me laugh) there that I wouldn’t necessarily write a whole post about here. I don’t really enjoy being busy, ha ha! But all’s well :) Thanks. I will have to wait for u to return here as I am not a facebook or twitter person! Am I quoting the wrong song, or the song wrong? 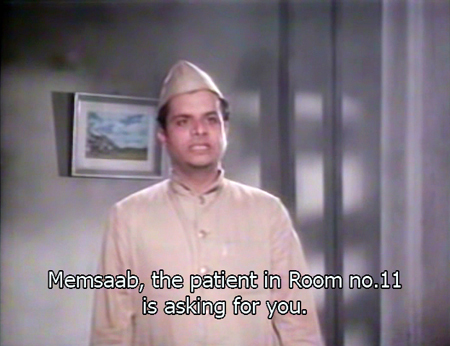 Anyway, what I meant is that as I and maybe Filmbuff are not residents of FACEBOOK, it is Memsaab who should be the guest; this is the general opinion as the person in Room No.11 is asking for her too-but not coming himself/herself. We are all mad to hear from Memsaab, right here, right now. Hope you are also in the crowd, Salim. Well, I don’t blame you Filmbuff and TG. I am not a Twitter person myself, although FB has helped me reconnect with some very old and dear friends. I’ll be back here soon, promise! Each to his own TG – No problem. But I prefer to do the chasing :- D. While I already had a Facebook account, I seldom used it. Following Memsaab’s page will help me explore this new territory. The cap I think is from Pagla Kahin Ka and patient is Shammi :-D Am I right? I will have a look :) WordPress connects to FB directly too, although it doesn’t work reliably. I am totally illiterate about facebook,twitter and other ocial networking stuff. I visit this blog daily, and that to me is the best way to keep abreast with the blog. I need not visit facebook to know what is going on in this site. I am not that busy a person to need facebook, twitter and other such stuff. Going directly to the site is good enough for me. A Facebook Page was long overdue, am real glad you finally did it.